From his home in Lafayette, California, MacKenzie has been leading the charge to help villages like Lalander recover from the violence and poverty that have long plagued their nation. His nonprofit organization, Trust in Education, has raised funds for the construction of a school and the organization of numerous other aid programs in this and nearby villages. Their goal is to restore the people of Lalander’s long-lost quality of life and get the village back on its feet. How long will such a project take? Trust in Education, he says, will keep working on behalf of Lalander and its neighboring villages until they “reach the point where they can support themselves.” Only by sticking around for the long haul, he believes, can the greatest difference be made. MacKenzie’s organization, and this unusual take on humanitarian work, originated at a public forum on the Iraq War held in Lafayette in March 2003. After this discussion, MacKenzie and a handful of friends decided to organize a humanitarian project to “make a difference” in areas affected by recent armed conflicts. Afghanistan, which had been torn apart by decades of war, was a natural place to focus their efforts. “We also recognized that given [the United States’] other commitments, including the war in Iraq, Afghanistan’s needs would receive less and less attention,” MacKenzie writes on his website. An April 2003 cover story in Parade magazine gave him the inspiration he needed. The article featured Greg Mortenson, the famous humanitarian whose work building schools in the mountains of Afghanistan and Pakistan has been credited by many with building support for the US and helping to undermine the Taliban’s hold on that region. Moved by Mortenson’s example, MacKenzie and a small circle of friends founded Trust in Education in May 2003 in the hopes of raising funds for this and other humanitarian efforts. 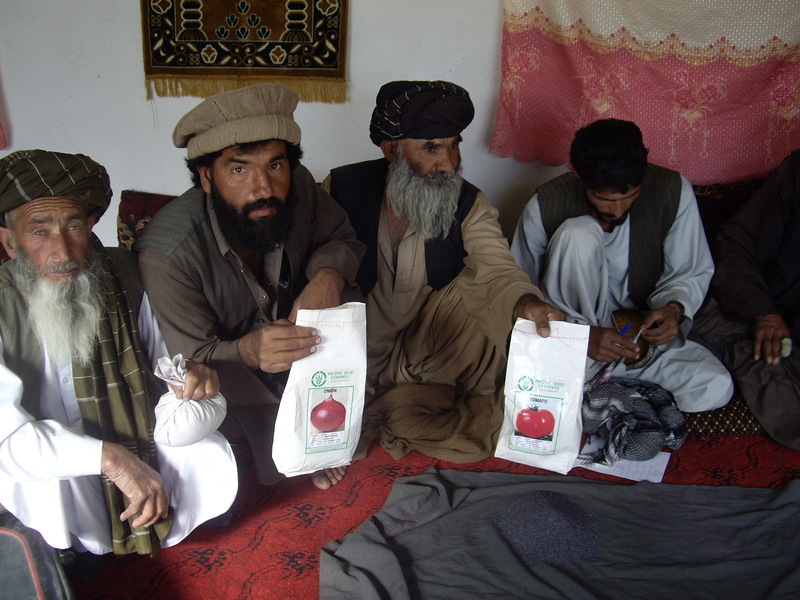 He contacted Mortenson and asked him to pick out an Afghan village that needed a school. Trust in Education’s first project would be raising the money to construct and maintain this facility. Mortenson picked Lalander, a community of a few thousand people located approximately twenty-five kilometers south of Kabul. The village had been used by militant Mujahadeen rebels as a base for launching rocket attacks into Kabul during the Soviet Union’s occupation of the country. The people of Lalander found themselves caught in the crossfire as violent retaliations by the Soviets leveled much of the town. “The Russians came out and destroyed the homes, destroyed the aqueduct systems, and planted land mines,” MacKenzie says. Soon after construction was completed, MacKenzie made his first visit to Afghanistan to see the completed facility. It would be the first of many trips this longtime attorney and businessman would make to the country that would come to mean so much to him. He found a beautiful country scarred by many conflicts, and hospitable people that nonetheless live in fear. The resurgent Taliban are an ever-present danger to Lalander. Coming into town periodically from across the nearby border with Pakistan, the group attempts to control the populace through intimidation and threats of violence. Many families are unwilling to send their daughters to the school for fear that the Taliban will learn of this and disapprove. To counter this, the school has begun to hold special classes in private residences. Encouraged by the success of the school construction project and with a growing affection for his new friends in Lalander, MacKenzie began to raise funds for a wide array of projects there. While the construction of a school had been a profound event for the village, he felt that more was needed to fully restore the community’s vitality. MacKenzie continued to raise money on the home front, embarking on what was to become a continuing campaign of fundraising and education in the US. He has been a guest speaker in numerous schools and rotary clubs, gathering donations while teaching audiences about the many problems facing Afghans. He decided to focus the efforts of Trust in Education in Lalander and the surrounding area indefinitely, devoting his resources to tackling the issues of a single community. This set him apart from many of his peers in the field of humanitarian aid. Many such organizations focus on improving a single aspect of life for the largest number of people possible; in Greg Mortenson’s case, this means building schools in each village he works in. While recognizing the contributions that have been made working in this way, MacKenzie felt that he could make the greatest impact by focusing his efforts, for the time being, on a limited geographical area. “What I kind of learned over the last five years is that in humanitarian aid…we do too much patchwork. One organization will go put a well in one location, and then 400 miles down the road somebody will put in a water system, or somebody 200 miles away will come in with a health clinic,” he laughs. Trust in Education has tackled its projects with the goal of restoring Lalander’s self-sufficiency. While attempting to restore the village’s agricultural system, for example, the organization provided not just seeds and fertilizer, but also a new irrigation system to improve productivity, fruit trees to establish orchards, and training seminars to teach residents improved farming skills. The long-term planning and support demonstrated by these projects is necessary, MacKenzie says, in order to make growing produce a viable financial alternative to the much more immediately profitable farming of opium. It is the same patience and commitment that he believes is needed to rescue the nation of Afghanistan as a whole. In the course of his work, MacKenzie has attempted to educate and inspire his fellow Americans to take a greater interest in the plight of Afghanistan and other third world nations. He has encounters a wide range of attitudes toward the subject. Many people wonder why they should donate money to overseas charities at all, given the many problems facing Americans at home. In becoming more conscious of the needs of countries like Afghanistan, MacKenzie believes that the US can improve its standing in the world. Being “better international citizens,” he thinks, will help diffuse the tensions that so often result in violence. “As far as the rest of the world is concerned, they see us as takers, right? We’ve been taking oil cheaply for a long time. We’ve provided guns and weaponry to people who provide us with, in their view, cheap oil.” He uses US involvement in Afghanistan as an example of shortsighted foreign policy. By arming the Afghans for their war against the Soviets but not taking the lead in rebuilding the country, he says, the US allowed a chaos to descend that sowed the seeds of modern terrorism. Trust in Education now has a permanent office in Kabul, and has begun to expand its activities to other villages in the Char-Asiab Valley. “I have started to actually move down the road now and started to meet leaders of other villages, who have of course been asking me to come for a long time.” During his most recent visit, he met with the governor of the valley to discuss a possible program of family planning seminars. Whatever the future holds for Afghanistan, Budd MacKenzie has demonstrated the power of an individual to make a profound impact. He believes that such involvement is a critical component of democracy. 2 February 2009, 00:00, by Daizangi. Founded in 1996 by Mary MacMakin, Physiotherapy and Rehabilitation Support for Afghanistan (PARSA) is a nonprofit, non-governmental organization (NGO) working directly with the disadvantaged people of Afghanistan. This year, PARSA celebrates its 11th anniversary of serving the widows, orphans, and disabled people of Afghanistan. Over the years, PARSA has flourished under the leadership of its founder, Mary MacMakin, who continuously conducted her charitable endeavors in Afghanistan despite imprisonment under Taliban rule and exile to Pakistan. In 2005, Mary turned over her role as Executive Director to Marnie Gustavson, who will focus on expanding PARSA’s services and educating PARSA’s Afghan directors to manage all aspects of PARSA’s operations. She shares Mary’s commitment to providing integrated educational and economic development programs for the widows, orphans, and disabled people of Afghanistan. In early 2007, PARSA moved to its new location at Marastoon (“the place that gives help”) in the Afghan Red Crescent Society compound in north-west Kabul (Afshar). In these more spacious and better equipped facilities, PARSA continues to expand its educational and economic development programs for the Afghan people. This growth has been made possible by generous funding from Caroline Firestone and the New Hudson Foundation. Bismillah, Budd MacKenzie who is an American and says that he is helping Afghans peacefully maybe true but what about those Americans who pointing their guns at Afghans and dropping B52 bombs? Ah? Are we going to forget those innocent Afghans who died in the Soviet invasion with the help of the CIA of the USA have been murdering them and supplying with money and weapons the Mujahiddin. Even now they are supporting different factions. Like the Northern Allinece - that took millions of dollars and let the US military to come in. Karzai and the Northern Allience are the two hands of America in Afghanistan. 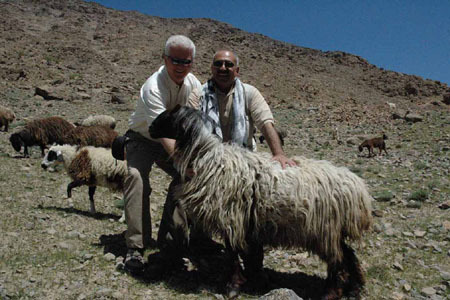 And here we have an American who takes pictures with poor Afghans and thinks he is doing a good job. How do we know he is not a CIA spy or somebody else. Tell us! The US military only come to Afghanistan for their own intersts and not for Afghans. So don’t let them trick you. Seeing photos of Afghans girls holding books and pencils is a joke. Yes, Afghans are poor and they would welcome any help but pen and pencil with some books to write is nothing. It is another way saying that the US in Afghanistan is helping and doing a great job. They are doing a great job killing innocent Afghans even though their installed puppet Hamid Karzai is not even concerned and if he is concerned then he is only acting and doesn’t care at all about innocent Afghans let alone his own Populzai tribe or Kandahar people. This "War on Terror" is a war on all Pashtun people and only Pashtuns are fighting the occupiers. Do you see or hear any trouble in the north of Afghanistan? Of course not! But light - INSHALLAH - is coming soon to Afghanistan. Your name, "Afghanistan’s Islamic Poisonous Army" says it all. You do not see any good, because you want only to promote conflict, and dominance with violence and blood, because poison is the only thing you can love. Budd MacKenzie and others like him have nothing to do with dark forces, and your unwillingness to recognize the good one person can do attests to your poisonous moral vacuum. How dare you introduce your hateful thoughts with Bismillah, you completely misunderstand Islam, morality and God’s/Allah’s love. Please listen, I’m an American soldier. I was in Afghanistan from 2005 to 2006. I did my best to learn the languages of Dari and Pashto. I just don’t want groups like the Al-Qaida to kill any more of my people. If I was in charge things would be different. I would rather see the Afghans with the best government that they could come up with as long as it doesn’t harbor any terrorist groups. Also the CIA was in Afghanistan in the 1980’s in order to contain the Soviet Union. They were a Godless stateless classless society. If we didn’t try to stop them things would have been much worse. They wanted to take away my right to pray to Jesus like they wanted to take away your right to pray to Allah. Please forgive those who misunderstand your society.